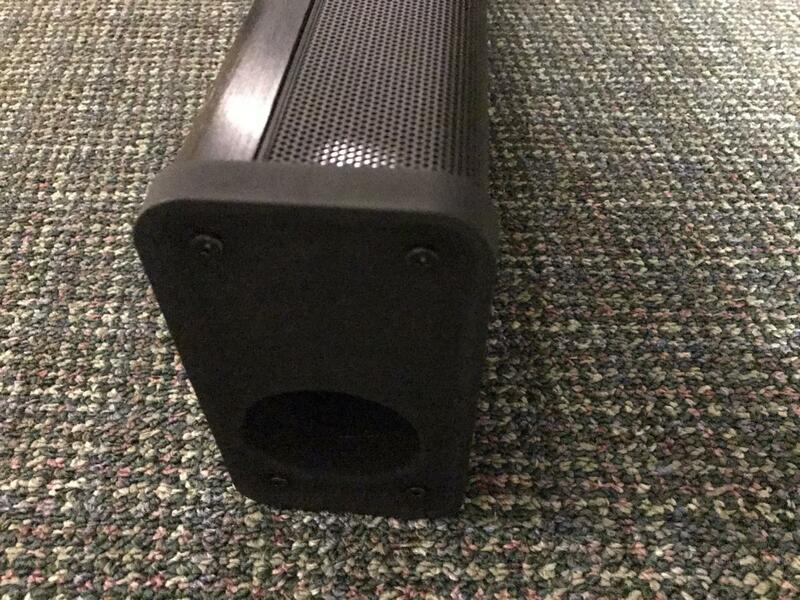 This sound bar doesn't need a sub to pump out the bass, but you an add one if you want. If the name Zvox doesn’t ring a bell, don’t worry. 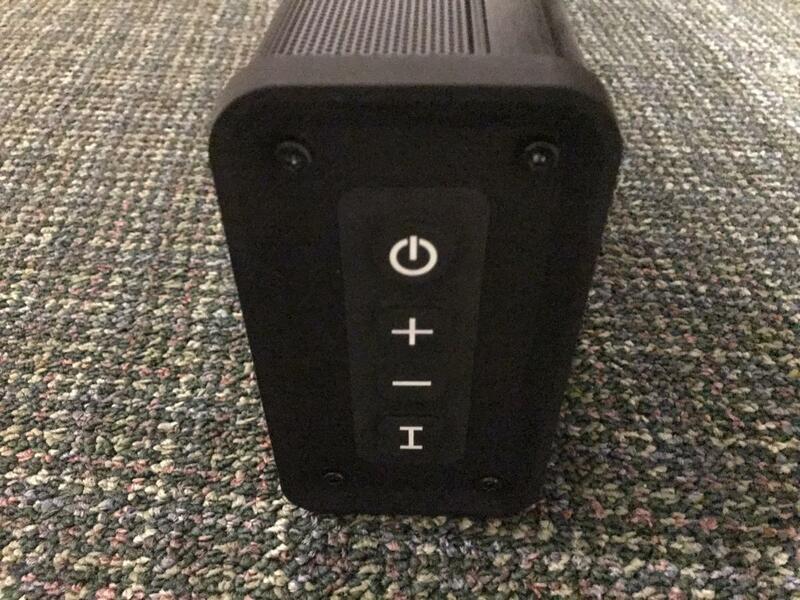 The company focuses exclusively on building soundbars and sound bases—10 models in all. With a marketing budget that’s likely smaller than what a Yamaha or Samsung spends on break-room donuts, general consumer awareness is never going to be high. But Zvox has made a mighty favorable impression in home theater circles. The Zvox SoundBar SB500 reviewed here features an all-aluminum cabinet, but don’t think beer-can flimsy. Build quality is top notch. This speaker measures 43.9-inches wide, 3.3-inches deep, 5.7-inches high and it tips the scales at 12.6 pounds. Zvox recommends pairing it with TVs as large as 90 inches. If you could peek under the hood, you’d see two 4-inch long-excursion woofers and three 2-inch long-excursion full-range drivers powered by a 140-watt Class D amplifier. There’s a bass port on the rear panel, where you'll find two Toslink optical digital audio inputs and one RCA analog stereo input (at press time, Zvox’s website was still showing a previous-generation SB500 that has one optical and one coaxial digital audio input). HDMI is not supported. You can also stream music to the SB500 from any Bluetooth source, and this is one of the few soundbars we’ve encountered that supports the aptX codec for near-CD quality streaming. The SB500 cannot be added to your home network, so it doesn’t support any streaming technologies (e.g., DTS Play-Fi or Apple AirPlay), nor can it connect to popular music-streaming services such as Spotify, Tidal, or Pandora. You can, however, use the SB500’s second Toslink input to connect an AppleTV or Chromecast dongle to the SB500 and connect those devices to your Wi-Fi network. The SB500 doesn’t come with a subwoofer, but after you’ve listened to this soundbar, you’ll likely decide your don’t need one. The SB500 can reproduce frequencies all the way down to 42Hz, which is lower than many soundbars with subwoofers are capable of reaching. The SB500’s left side has a clearly-visible port which helps the soundbar reproduce those low frequencies without a sub. Should you really want to shake the neighborhood, you can add the subwoofer of your choice thanks to a dedicated output on the SB500’s back. This is a far more flexible option than other soundbars that lock you into the subwoofer that comes with the unit. The SB500 can be oriented three ways: face front (firing into the room), face up (firing toward the ceiling), or hung on a wall (find studs or use heavy-duty wall anchors. Zvox recommends using hardware that can support at least twice the SB500’s weight, and remember, it weighs nearly 13 pounds.) Your orientation choices will alter the soundbar’s tonal character, with the face-up position making a noticeable difference in the midrange and high frequencies. You can choose between three DSP (digital signal processing) modes that will optimize the SB500 to your installation. Don’t confuse these DSP modes with a proper room-correction system, however; room correction solutions compensate for a speaker’s interaction with the unique sonic characteristics of your room. 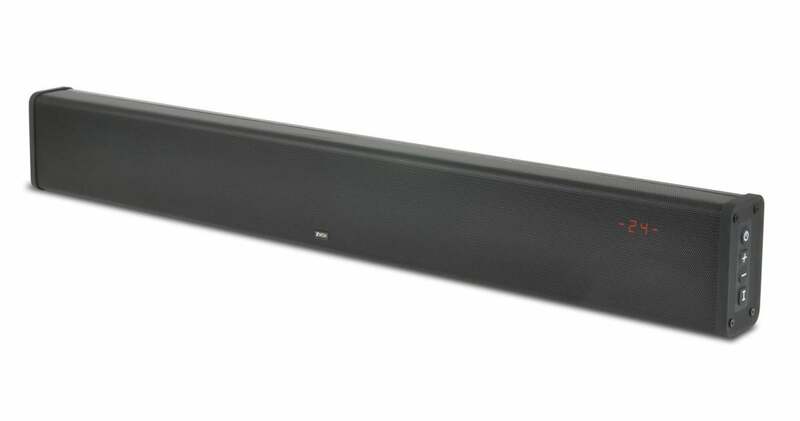 The Zvox SoundBar SB500 has a mounting keyhole on the back of the unit for wall-mounted installations. During my evaluation of the SB500, I set the speaker on a table below my TV and facing my listening position. Should you also opt for this orientation, be warned that the Zvox will sit 5.7-inches high and is likely to block your TV's infrared receiver if the receiver located in the TV’s lower bezel. Zvox doesn’t offer an IR repeater to pass signals through to your TV, so you’ll to either elevate the TV or lay the SB500 on its back with its drivers facing up. This will reduce its height to 3.3 inches. Most soundbar remotes are downright terrible. Zvox’s credit card-style remote isn’t exceptional, but it’s certainly above average. You’ll find it to be larger and thicker than most remotes of this type, with buttons that are labeled clearly and laid out logically. Several buttons have additional markings that indicate what the SB5500’s on-screen display will show when you press that button. It’s a smart idea that takes a bit of the guesswork out of things. Zvox doesn’t offer an iOS or Andriod app, but if you don’t like its remote, you can stick with whatever you’re using now. The SB500 can learn the volume, mute, and power-toggle codes that your favorite remote uses. But you’ll still need the Zvox remote to access the speaker’s special functions. The SB500 has large, easy-to-read controls for power, volume up/down, and input select on the its end cap. 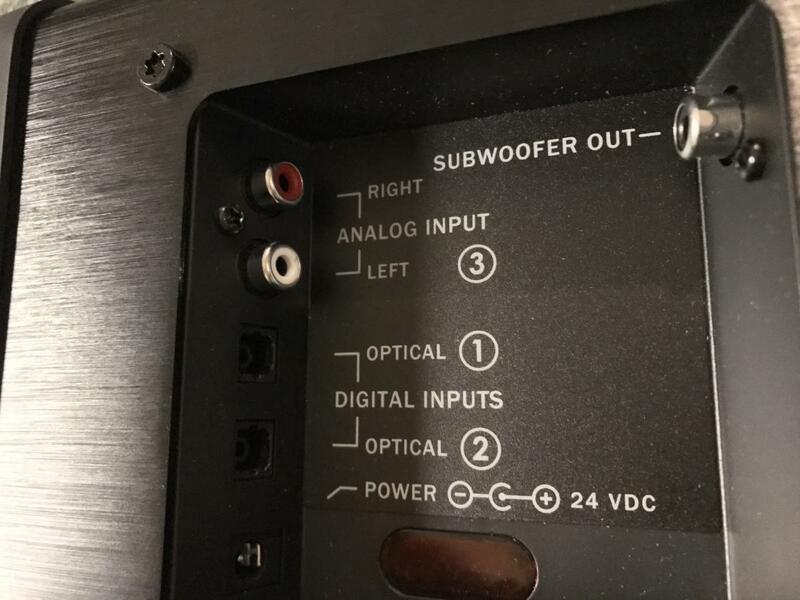 If you ever need to make quick adjustments on the soundbar itself, you’ll find four physical controls located on the soundbar’s right end cap. You can control power, volume, and input selection using large and clearly marked buttons. Like most soundbars that lack an iOS or Andriod app, the SB500 has a display built right into the speaker. This one is large, orange, and easy to read from across the room. You’ll always know the volume level, and you’ll get visual feedback of any commands you give it. The SB500’s display is clear and legible from a distance. The display appears only when you issue a command to the soundbar, and it turns off several seconds after so it's not a distraction while you’re watching a movie or TV program. The only drawback with the display is the fact that its limited in the amount of information it can convey. Don’t expect full words to scroll by. Nevertheless, you’ll quickly learn the acronyms and abbreviations because they’re logical and explained thoroughly in the user manuals. Speaking of user manuals, the Zvox comes with some of the best instructions I’ve seen in consumer electronics. The SB500’s quick setup guide is richly illustrated and easy-to-read with large type on an 8.5. x 11-inch booklet. It’s just the ticket for technophobes, and folks who have difficulty reading small print won’t need to pull out a magnifying glass. A second booklet explains the SB500’s various functions. In those pages, you’ll learn how to set the power bar’s installation orientation; tell the soundbar if you want it to receive IR commands from a handful of common TV and audio manufacturers, such as Sony, LG, or Marantz; and how to set the speaker so that it automatically shuts down after 20- to 30 minutes of low or no audio. The SB500 comes with all the accessories you need to get started, including rubber pads to prevent marring your wall or table. Installing the SB500 was a piece of cake. It took mere minutes. 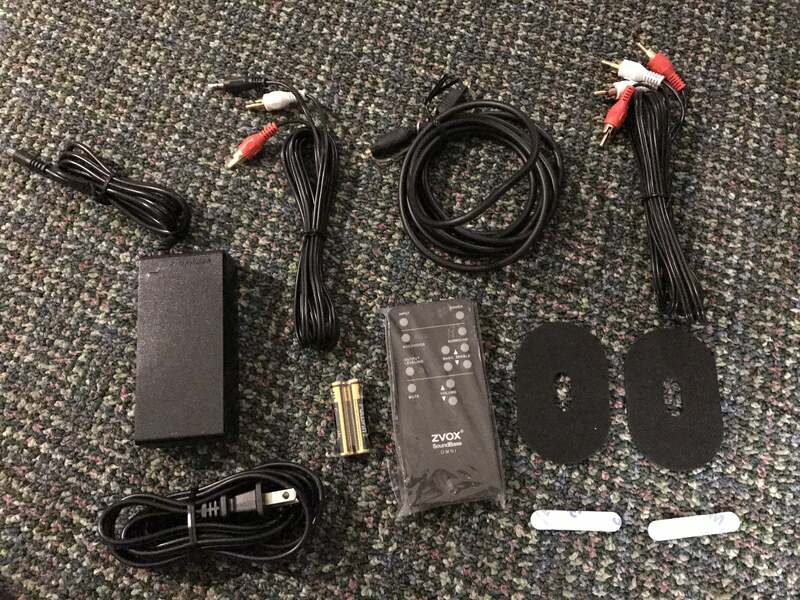 Connect all your HDMI sources to your TV. Connect either the included Toslink digital optical or RCA analog cable between your TV and the SB500, and you’re done. The SB500 announces it’s presence in your setup. The first thing you’ll notice is the bass—and it’s not subtle. Punches, explosions, engine roars all have bite. In Rogue One: A Star Wars Story, for example, during the scene when the members of the Rebel Alliance spring Jyn Erso from the imperial transport vehicle, every punch and blaster shot filed my room with excellent dynamics and energy. I also tried out Zvox’s PhaseCue, which the company says manipulates the phase of the soundbar’s channels to try and fool you into thinking that sound is coming from different parts of the room. I’ve found that with such technologies, your mileage will vary based on the dimensions and physics of your room and ceiling. I can see a group of consumers who will like the increased sensation of depth and space PhaseCue creates. But to be clear, PhaseCue never came anywhere close to replicating the amazing surround sensation I get with my 7.1-channel home theater system driven (a fact Zvox readily admits). 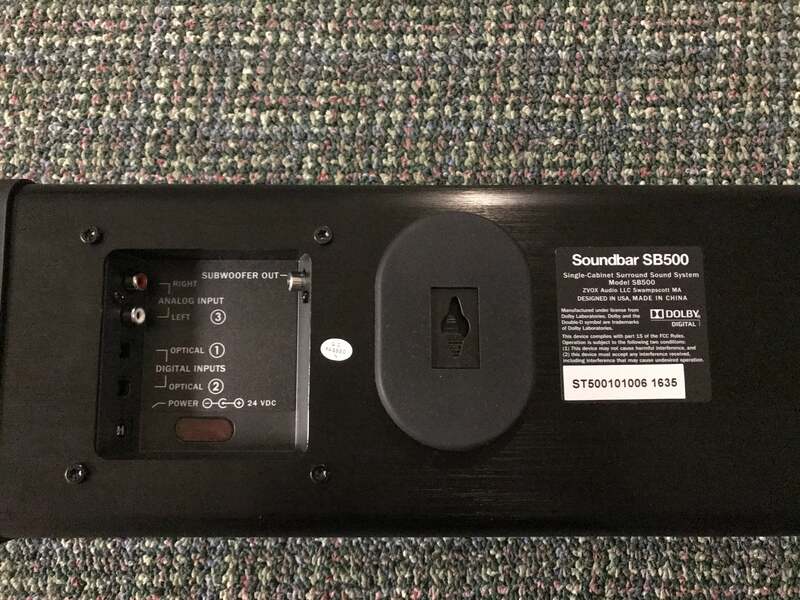 The Zvox SB500’s inputs and subwoofer output are recessed on the unit’s back. There are two Toslink digital optical inputs and an analog RCA input here. The SB500 can help make tough-to-decipher dialog clearer with its AccuVoice technology. Pressing a dedicated button on the remote toggles AccuVoice on or off. ACCU (in all caps) appears on the soundbar’s display to let you know you’ve engaged it successfully. I found that AccuVoice made dialog more intelligible, but that it also boosted all other sounds in the same frequency range. If one of your main objectives in buying a soundbar is to make dialog easier to hear, you’ll love the SB500. The effect is dramatic—it’s almost like opening a window. When I engaged AccuVoice while Donnie Yen, who plays Chirrut Imwe in Rogue One, says “May the force of others be with you” in the midst of a crowd, AccuVoice lifted his voice to the forefront, making it clear and intelligible. If you’ve also jumped out of your chair because of loud commercials, the Zvox has you covered here, too. 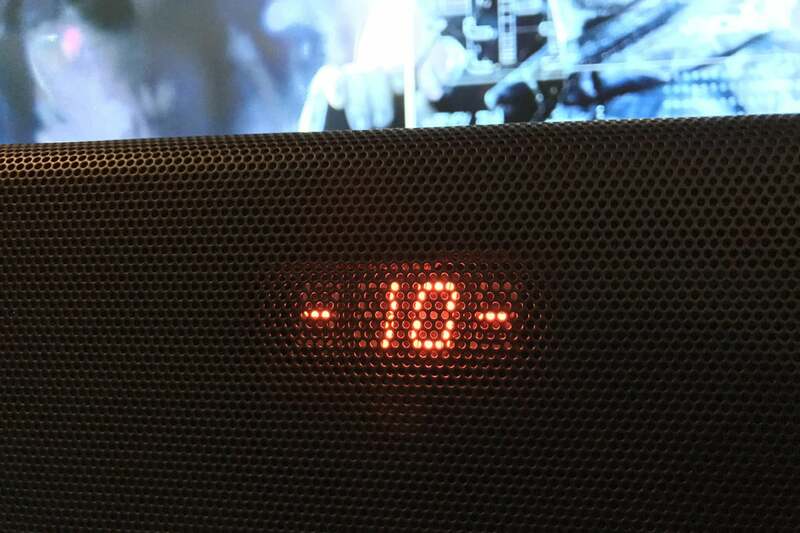 It will squash any untamed commercial volume and bring it right in line by turning on the the soundbar’s Output Leveling feature (OL on the display). A simple press of the remote’s button turns it on. Output Leveling and makes a dramatic difference in the soundbar’s dynamic range. Playing the opening scene of Rogue One with Output Leveling enabled, the accompanying orchestral score takes a noticeable hit. Blaster fire, machinery, ambient effects, pretty much everything takes a hit. This is a great setting when you’re using the soundbar late at night or you encounter loud commercials, but I didn’t like it when watching movies because it really sucked the life out of them. The Zvox SoundBar SB500 is simply the best all-in-one soundbar I’ve heard at this price point. It delivers clear, clean dialog; rich, deep bass; and superb dynamics for a true in-home cinema experience. And the ability to add an external subwoofer—not that I think one is necessary—is simply icing on an already delicious cake.